Talks to cede the largest opposition holdout in southwestern Syria to the government have failed, triggering an intense overnight bombing campaign on the densely populated town. The attack left a dozen people dead and over 100 hurt, activists and rescuers said Wednesday. 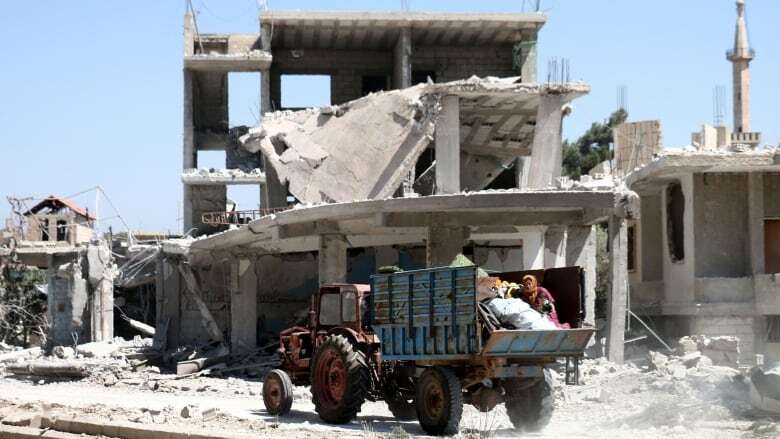 Talks to cede the largest opposition holdout in southwestern Syria to the government have failed, triggering an intense overnight bombing campaign on the densely populated town. The attack left a dozen people dead and over 100 hurt, activists and rescuers said Wednesday. Britain-based Syrian Observatory for Human Rights said an overnight "frenzied" bombing campaign continued into Wednesday, with at least 350 missiles lobbed into Nawa and its surrounding areas. The observatory said at least 12 were killed as rescuers struggled to get to the casualties. Khaled Solh, head of the local Syrian civil defence known as White Helmets, said only one ambulance was able to access the town and civilians relied on their cars to bring out at least 150 injured. He said the only hospital in the town was struck in the overnight campaign, rendering it non-operational. He said one of the last orthopedists in the town was killed in the strikes. In less than a month, Syrian government forces backed by Russian air power have been able to seize control of most of Daraa province, including the eponymous provincial capital that was the cradle of the uprising against President Bashar al-Assad more than seven years ago. They have stepped up their military offensive on the remaining opposition pockets in the southwestern region that includes Daraa and Quneitra provinces, which straddle the border with Jordan and the frontier with the Israeli-occupied Golan Heights. The latest developments in the Syrian war on Wednesday included a campaign in the southwest city of Nawa, while over 80 buses shuttled thousands in the northwest towns of al-Foua and Kefraya in Idlib province. The observatory said warplanes and ground forces have also targeted with a barrage of missiles the southern tip of the region, which is held by a militant group affiliated with the Islamic State in Iraq and Syria (ISIS). With most of Daraa under control, government forces have turned their focus to the area near the frontier with Israel, to clear the last pockets of the opposition. Meanwhile, in the northwest, buses arrived on Wednesday to evacuate thousands of people from two Shia villages, which Sunni Islamist rebels have besieged for years, as part of a deal under which the Syrian government is expected to release hundreds of prisoners. The villages of al-Foua and Kefraya in Idlib province, which are loyal to the Syrian government, will be emptied of all their residents and fighters. Idlib is the last major insurgent stronghold in the country and where neighbouring Turkey has deployed forces. Some 7,000 people will leave the two villages, said al-Manar TV, run by Lebanon's Shia Hezbollah movement. Population transfers have been a common feature of the seven-year Syrian war, which has killed an estimated half a million people and driven some 11 million people from their homes. Most of the transfers have come at the expense of Assad's opponents. Rebels and civilians have been taken by bus out of their hometowns to opposition territory in the north, as government forces advanced with critical help from Russia and Iran. Where does Syria go from here? The opposition has decried it as a systematic policy of forcible displacement against those who oppose Assad. The conflict took on a sectarian dimension as it swelled out of protests against Assad's rule in 2011. Assad comes from the Alawite sect, an offshoot of Shia Islam. Opposition sources said officials from Hayat Tahrir al-Sham, a coalition spearheaded by Syria's former al-Qaeda offshoot, and Iran's Revolutionary Guards had negotiated the latest swap. Under the deal, the evacuees will include Alawite hostages that insurgent factions took when they overran Idlib more than three years ago, a pro-Assad commander told Reuters. 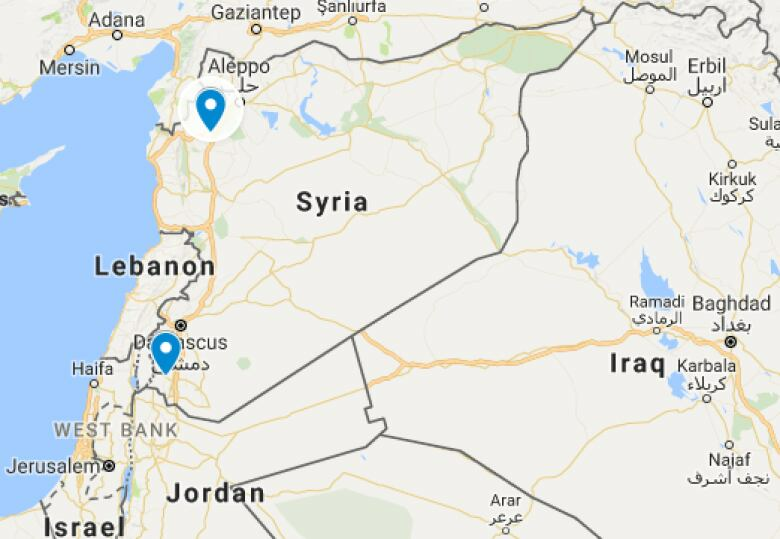 State TV said at least 88 buses had entered al-Foua and Kefraya in Idlib province so far on Wednesday, along with Syrian Arab Red Crescent (SARC) ambulances for sick residents. In April last year, thousands of people were shuttled out of the two villages to government territory in an agreement. In exchange, hundreds of residents left two towns at the border with Lebanon, Madaya and Zabadani, which were in the hands of Sunni rebels at the time and under siege from pro-government forces. They were moved to Idlib. But other parts of the deal — evacuating the people remaining in al-Foua and Kefraya and releasing 1,500 detainees from state prisons — did not go through at the time.